Brig. Gen. Christopher LaNeve, right, and Command Sgt. Maj. William Gardner II, left, the 7th Army Training Command command team, make a donation to the annual Army Emergency Relief campaign March 4 at the 7ATC Headquarters, Tower Barracks, Grafenwoehr, Germany. 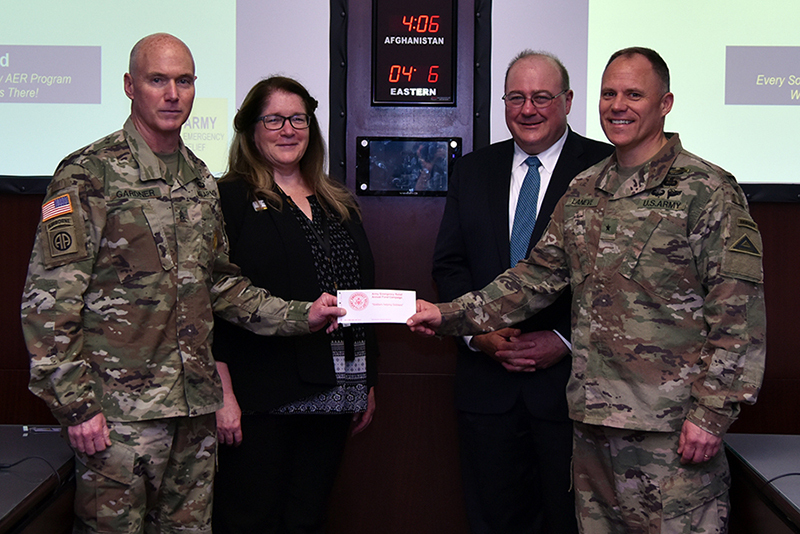 Retired Lt. Col. Joel Levesque, chief financial officer for Headquarters AER, and Mary Cron, USAG Bavaria Financial Readiness Program manager, were present for the donation. GRAFENWOEHR, Germany — U.S. Army Garrison Bavaria Army Community Service will run its annual Army Emergency Relief Campaign March 1 to May 15. USAG Bavaria community members are encouraged to donate to the campaign. This year’s goal is $60,000 for the garrison’s footprint. To help meet these needs, community members located within USAG Bavaria at Grafenwoehr, Vilseck, Hohenfels and Garmisch can continue the tradition of “taking care of our own” with a voluntary contribution to AER during the campaign. “With more people being made aware of how AER assists, and what they assist with, in times of financial need, it only follows that the generous nature of our Soldiers and retirees, along with those who work with them, are more willing to support the AER campaign through increased donations,” said Cron. The easiest way for Soldiers to donate is by allotment. This can be done to fit anyone’s budget with allotment amounts starting as low as $1 a month (50 cents per paycheck). Soldiers should contact their unit’s AER representative. If you don’t know who your unit representative is, ask your chain of command. In some instances, the situation can be just as easily resolved through the Soldier’s chain of command through AER’s Commander’s Quick Assist Program. Talking to the commander or first sergeant may be the first step.